Exam was advertised as a Brit horror with an intriguing premise and an exciting new talent in the director's chair. 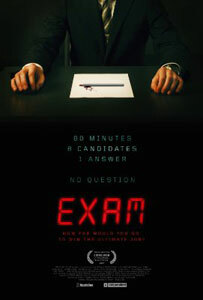 The film centres on eight people sitting a mysterious exam and competing for the ultimate job in a powerful corporation. Sadly this thriller was light on thrills and made for an intensely boring experience. Exam is slow and ponderous with a silly script which is filled with unlikely leaps of logic by the completely unsympathetic characters. Going in expecting some kind of horror tinged paranoid competition to the death it could not have been more disappointing.